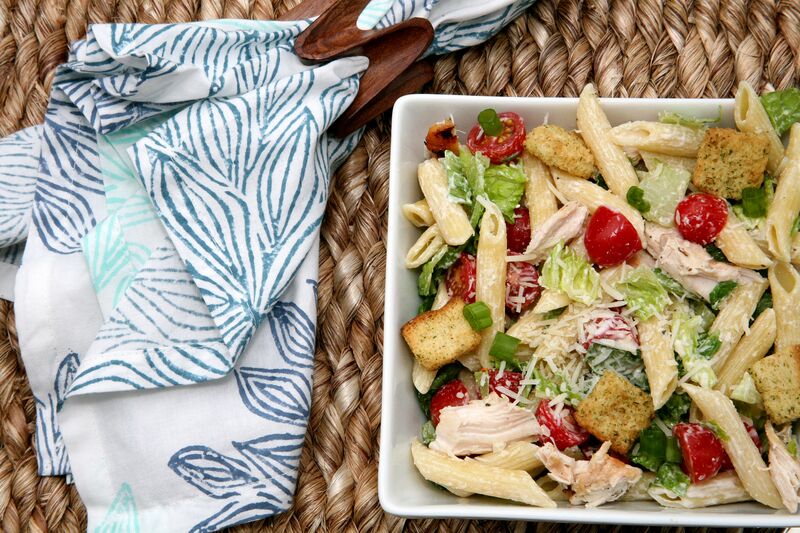 I made this pasta salad with my husband in mind, because he loves Caesar dressing with anchovies. In fact, he prefers to have those tiny fish laying over his lettuce as well. Have I lost any readers yet due to disgust? I apologize; let me finish the thought so we’re on the same page again. I love seafood and I don’t mind knowing anchovies are minced into my salad dressing, but eating them out of the can or on top of my salad is taking it too far! Back in agreement? Good, because this salad is worth handling anchovies to make a delicious dressing! Homemade is always better in my opinion so once I found out this dish had a recipe for the dressing too I was sold. It’s creamy, flavorful and perfectly light mixed into the salad. I always know when my husband is excited or finds something he really likes, because he mentions it over and over….and over 🙂 I believe he told me how good this dressing was around three times the evening I made it. Needless to say, I’ll be making this again soon! Perfect Summer lunch and a happy husband is a win win! Check out the recipe below and enjoy!! In a small bowl, stir together the first six ingredients until well mixed. Note: I minced the garlic and anchovies in my Ninja food processor, added the other mixed ingredients and blended until smooth. Toss half of the dressing with the cooled pasta and refrigerate for 30 minutes. 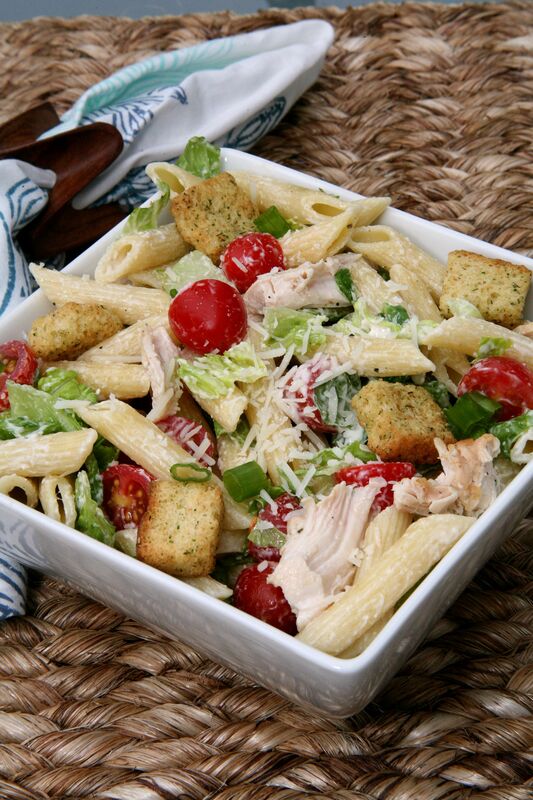 Remove from refrigerator and mix in lettuce, tomatoes, green onions, cheese and chicken. Add remaining dressing, toss to evenly coat and top with croutons.